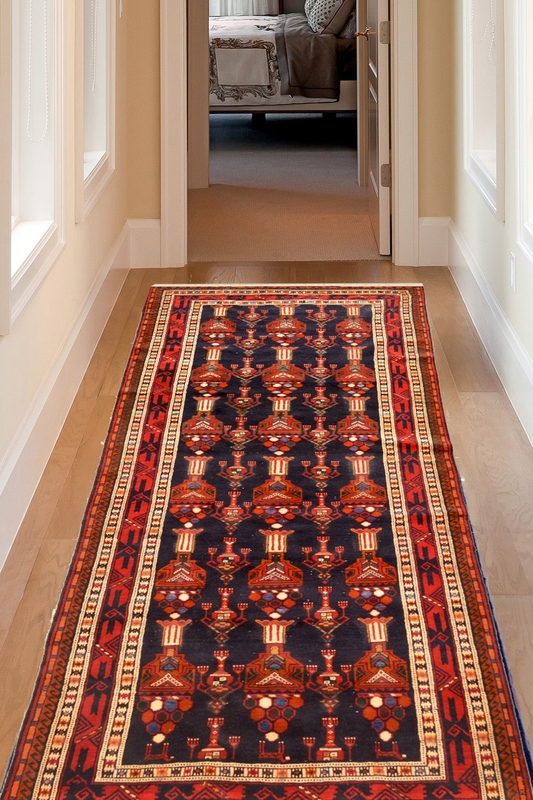 Unusual Egyptian Afghani Area Runner with rust, yellow and ivory mix border and have blue ground gives outstanding look. This rug is handmade in 100% wool and cotton material and can be used as a featured rug in any given room. Rust border with royal blue and ivory base. Egyptian pattern with herbal washed tassles. The design of this Afghan rug has an Egyptian influence and this is evident from its bright vibrant colors. The intricate pattern of this designer rug makes it a unique one and can also be used as a featured rug runner in any given space. As seen in the image, this Rugsandbeyond beauty has a unique sheen to it. Will be shipped within 48 hours of order placed. Vacuum regularly in the direction of the pile of the rug. Clean liquid spills immediately with a damp cloth or sponge. For hard to remove stains, professional rug cleaning is highly recommended. Avoid direct and continuous exposure to sunlight. Please note that lengths and widths may slightly vary from published dimensions although we strive to provide the most accurate measurements possible. We try our best to display the most exact images. There might be a slight distinction in color between the actual product and your screen due to difference in computer monitors.